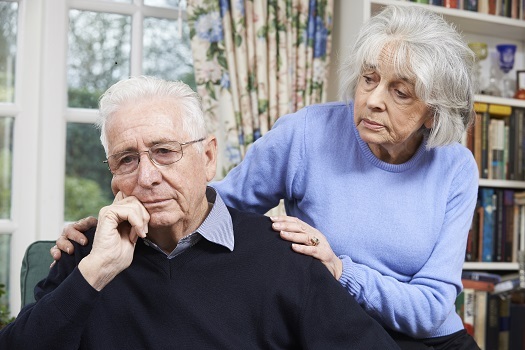 Memory loss, confusion, changes in personality—when an older loved one exhibits these signs, your first thought may be that he or she has dementia. However, the truth is that a person can show these and other dementia signs and symptoms but actually have another health issue—one that, in many cases, is treatable, so it’s important to see a doctor right away. Here are some common conditions that may at first appear to be dementia. Medication side effects are one of the most common reasons seniors experience symptoms such as confusion and memory loss. This happens for several reasons, including a toxic buildup of the drug in the system because kidneys aren’t filtering the medications out like they should, interactions among medications that shouldn’t be taken together, and allergic reactions to certain medications. Side effects can occur with any type of drug, ranging from antidepressants to prescriptions for high cholesterol and cardiovascular health. Always make sure the doctor knows what your loved one is taking, and alert the doctor immediately if there’s any kind of reaction. Taking medication may not impact your loved one, but stopping a medication might, and it can lead to symptoms that mimic dementia. Withdrawals are most commonly associated with medications prescribed for depression and anxiety, especially if they have been taken for a long time. Withdrawal can also happen if your loved one drinks alcohol often and decides to stop. Anytime your loved one wants to stop a medication or any type of stimulant, it’s best to consult with a doctor about the safest way to do so. Some seniors may require constant supervision while going through withdrawal from medication or alcohol. If your senior loved one needs around-the-clock assistance at home, the Richardson, TX, live-in care professionals at Home Care Assistance are here to help. Our proprietary Balanced Care Method was designed to promote longevity by encouraging seniors to focus on healthy eating, regular exercise, mental engagement, and other important lifestyle factors. Many seniors don’t eat a healthy diet for one reason or another. They may not have access to nutritious foods, or they may let physical or mental health issues impact the way they eat. For this reason, it’s not uncommon for seniors to be deficient in certain vitamins, which can lead to dementia-like symptoms. This situation is especially common with a B12 deficiency, but it can also occur with B6, B1, niacin, and folic acid deficiencies. It’s important to make sure your loved one always has access to healthy foods, such as lean proteins and fresh fruits and vegetables. It may be necessary to take a vitamin supplement as well. Some seniors have mobility issues or health conditions that make it difficult to plan and prepare nutritious meals on their own. Families who need help caring for a senior loved one can turn to Home Care Assistance, a leading provider of Richardson in-home care. Services available in our customizable care plans include meal prep, mental and social stimulation, assistance with personal hygiene tasks, and much more. Sometimes the symptoms that mimic dementia are simply due to a change in emotional health status. Experiencing depression can lead to problems such as forgetfulness or an inability to concentrate. Pay close attention to your loved one if you suspect he or she is depressed, and suggest seeing a doctor. Signs of depression may include avoiding social contact with friends and family, no longer enjoying hobbies and favorite activities, difficulty sleeping, lack of appetite, and irritability. The last item on this list can be more serious than the others, but it is treatable. Benign brain tumors called meningiomas can press on the brain and impact the same functions that conditions such as dementia do. Other symptoms may include vision loss, double vision, frequent headaches, coordination difficulties, and seizures. If your loved one experiences any of these issues, make an appointment with a doctor as soon as possible. In many cases, surgical removal of the tumor is an option. If your loved one is ultimately diagnosed with dementia, he or she can still live at home in safety and comfort with the help of a professional caregiver. Richardson elderly home care professionals can be a wonderful boon to seniors. Whether they require around-the-clock supervision or just need assistance with exercise and household tasks a few days a week, seniors can enjoy a higher quality of life with the help of trusted in-home caregivers. If you need compassionate, professional care for your loved one, call one of the friendly Care Managers at Home Care Assistance today at (469) 573-4213.